The F/A-18 Hornet fishtails while taxiing after landing in icy conditions this morning. A U.S. Navy Blue Angels jet slid off the runway in icy conditions at the former Brunswick Naval Air Station while nearing the end of its taxi early Thursday but was not damaged in the incident. The single Blue Angels jet – part of the Navy’s renowned acrobatic flying team – landed at the Brunswick airport around 7:30 a.m. but appeared to fishtail while taxiing at a slow speed as it approached the end of the runway. The plane is in Brunswick as part of a logistics trip in advance of a September performance by the Blue Angels at the Great State of Maine Air Show. A plane tow vehicle and several trucks responded and crews appeared to spread additional salt near the plane, but the aircraft had not been moved as of 9:30 a.m. Mays said the plane ended up in the grass right next to the tarmac after ice on the runway prevented the jet from making a complete stop. The plane is visiting Brunswick Landing, as the former naval air station is now known, in part to promote the air show slated for Labor Day weekend next year. Mays and Capt. Jeff Kuss, who handle logistics for Blue Angels appearances, plan to meet with Brunswick Landing representatives, visit the airfield and inspect facilities. The Blue Angels are known for their precision formation flying and acrobatics, often flying as close as 18 inches from each other. The Blue Angels will be the featured performers during the air show on Sept. 5 and 6. This will be the Blue Angels’ first appearance in Brunswick since 2011. 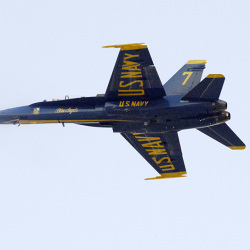 The Defense Department canceled most military aerial demonstrations in 2013 – including a planned Blue Angels appearance in Brunswick – because of the “sequestration” budget cuts. Organizers of the Great State of Maine Air Show canceled the event roughly six months before the show because of the budget uncertainty. “We’re just happy to be back,” said Mays, a Massachusetts native. The Brunswick show will be the farthest north the Blue Angels will perform on the East Coast next year. Tickets go on sale on Dec. 12 at 8 a.m.